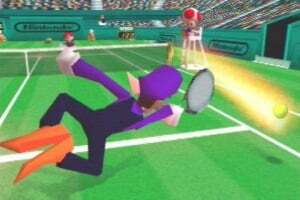 When Mario Golf was released back in 1999, it was already known that Camelot was working on another Mario sports title for the N64. After a decent title released for the sadly ill-fated Virtual Boy a few years before, Camelot gave Mario another go at tennis. 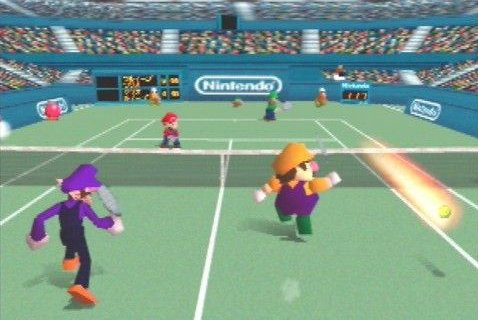 Mario Tennis on the N64 functions a bit differently from Mario Golf in that you do not have to sit through a cumbersome (and honestly quite difficult) single-player mode to unlock almost every single character, one by one, for play in other modes. In fact, only two characters are locked at the start of the game, and they can be obtained rather easily. What you're most likely to jump into to get the feel of the game is a standard match. These come in two flavours: Singles and Doubles. It's not too hard to guess what those mean: Singles is a one-on-one match, while Doubles is two-on-two. As this is a Nintendo 64 game, four-player matches are a possibility. Very similarly to Golf, Tennis uses a button combination system to let you choose exactly what kind of hit you want to make. Charge up with A and then hit B when the ball's close, for example, to do a lob shot – this tends to make the ball go up high, coming down very slow towards the back of the opponent's side of the court. Do it the other way around by hitting B then A and you'll do a drop shot, which gives the ball a very small arc and makes it hit the ground almost immediately once it's past the net. There are plenty of different combinations (yes, with just two buttons!) and knowing when to use what type of shot can easily help turn the tide in your favour. The courts you play on are fairly grounded in reality – all but two (both only available in special game modes) have no bizarro Mario-esque special gimmicks. Some of them feature a large picture of the owners (such as Mario and Luigi) spread over the ground, but these serve no purpose other than to tell all of the game's courts apart. Each court also has its own unique characteristics that determine ball speed and bounce strength. This serves as a sort of "difficulty select," as you can choose what you want the game to be like just by picking a court characteristic combination you like. Curiously absent are the "human" characters introduced in Golf, as the cast here is made up entirely of familiar faces from other Mario games. Except, at the time of the game's original release, two of them: Daisy, who hadn't appeared in any games other than Super Mario Land and one or two obscure titles prior to Tennis; and Waluigi, who actually made his debut here. Of course, both of them appear in just about every multiplayer Mario game released since, but it's interesting to see what the two originally looked and acted like in 3D. As in Golf, the characters are divided into certain skill types. Mario and Luigi are all-around types, as usual, but the rest of the cast is divided into Speed, Power, Technique and Tricky players. Each of these caters to a different play style: Power players should try to beat their opponent with super-strong and fast smashes, while Technique players should try to use their incredible accuracy to send the ball flying towards a nearly unreachable or unexpected spot for the opponent(s). Of course, it wouldn't be a Mario game without a few less realistic game modes. Ring Shot is another familiar concept: rings will appear over the court, and whoever hits the ball through them will get points. With each hit, the rings increase in size and become worth less, so you'll want to try and get the ball through them as soon as they appear. The Piranha Challenge is a simple test of skill. Three Piranha Plants will fire balls at you (One at a time) and you simply have to hit them all back. The other side of the court also has an opposing player, though, and he or she will actively try to hit back all balls you manage to hit, after which you cannot hit them a second time. If you manage to hit all 50 balls past your opponent you can pride yourself on beating one of the hardest challenges in Mario sports game history! The Bowser Stage features a special court set in Bowser's castle which continuously tilts back forth over a pit of lava. To make matters worse, there's item boxes above the net – smash the ball through them and you'll get items to annoy your opponents with. What is highly disappointing about this Virtual Console re-release is the lack of Game Boy Colour link support. In Mario Golf, this only meant you lost out on a bunch of extra characters from the GBC game, which were fully customized to your desire and as such tended to be massively overpowered, but you lose out on a bunch more here - Aside from not being able to import four more customized characters from the GBC game, there are six more courts, some of which also feature unique characteristics (such as one with the fastest speed and the strongest bounce), which you will be unable to play on. It would have been nice if Nintendo had found a way to have these unlocked at the start for the VC! 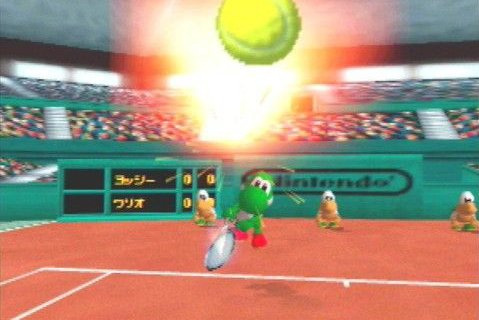 For a 2000 release one would expect Mario Tennis to look great for a N64 game, and that is indeed the case. Every character has a large variety of facial expressions and animations, and there is never any case of slowdown, as the game always keeps going at full speed. Like Mario Golf, the music is quite upbeat and sounds good, although it's not too catchy. The character-specific courts feature remixes of music from their appropriate games. All in all it's a frantic, fun game. Obtaining all of the unlockables this time around will take far less time than it would in Golf, but that's fine; there's an obvious multiplayer focus on the game, and it's an absolute blast to play with friends. 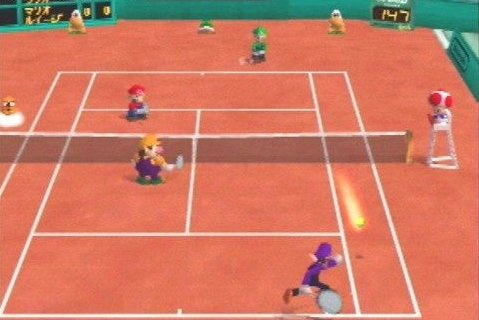 With Mario Tennis, the portly plumber proves once again that he can make any sport more entertaining. The game later received a sequel on the GameCube and Wii, which, despite mostly being very similar, introduced some questionable gameplay elements that many did not particularly enjoy. 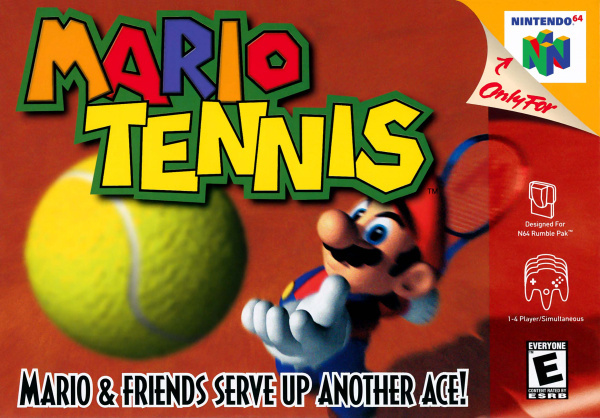 If you were one of those people and would rather have a pure, unspoiled Mario Tennis experience, look no further: this is his best outing so far. The big question: Is this the best Mario sports title ever? 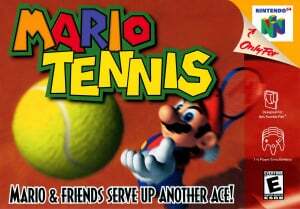 Lol, the picture used is for Mario Power Tennis. Anyway, nice review. Looking forward to trying it to see how it compares with MPT - which I happen to love. @Dragoon: It certainly looks that way. @Dragoon Mario Super Sluggers on Wii is my favorite. Its Wii Sports baseball on steroids and a sugar rush! 10:10 Toatally awesome. Does anyone know why dk j.r. hasnt appeared in any other mario game since this game. I never played the N64 version. I have a Virtual Boy along with this game in my storage somewhere and I remember playing this game and Mario Clash all the time on the Virtual Boy. Oh I also played the Gamecube one that was redone so you can use the Wii remoter. Maybe if they bring this one out on the VC I will pick it up. The Mario sport games are fun I really like the baseball one and soccer one the best. Didnt really care for Mario Golf. @Caliko, @Shadx: Sluggers and Strikers Charged are awesome. So much fun. great review! Camelot made the BEST mario sports games. I don't care much for the Mario sports games, but this one I love. I can't explain it, but it's a quality title. The word "piranha" isn't showing up when I view the article for some reason; instead I'm getting a string of hash marks, as if it's been censored. Odd. Anyway, this is a great game. Back in university, we spent hours playing Perfect Dark and this in multiplayer. As good as PD is, this game has the edge for me. We didn't have the Gameboy linkup back then, and I have to say we didn't miss it. Good review, but I do have one question; how does this play on the controller choices available on Wii? I recall it controlled very well on the N64, but I can foresee the different button layout causing issues. For those who like this title, I'd also suggest Anna Kournikova's Smash Court Tennis on the PlayStation. The questionable licence aside, it's essentially a Namco version of this game, and seems to have the same, or very similar, engine underneath, so it's a very complementary experience. Awesome. I didn't like Power Tennis, so it's good to hear that this is better. Buying it as soon as I can. @Kelvin: How odd. Can view it fine on my end. Yeah, looks fine to me. As for the game, I loved this and it's better than the Cube version imo. I have to agree with the end comments I prefer this N64 version in comparison to the Gamecube sequel a lot more. I hope this game doesn't get delayed in the US until near the release of Mario Sports Mix. 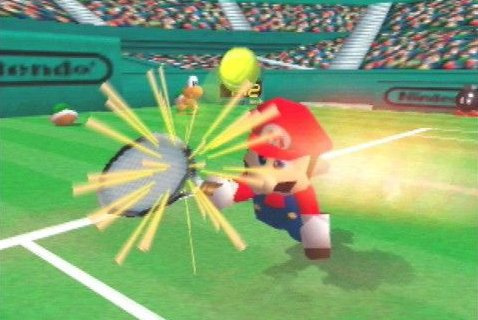 Altough i love the N64 version, i don't see why Mario Tennis is better than Mario Power Tennis. Everything is better in the GameCube version, just turn off the power shots. However, in the Wii version the controls are totally screwed. Good game. I can remember playing it in first grade, and yet it is still difficult. Note: I left out the Kart series to be fair to the rest. Despite this game having a lot of basic mechanics down and a fast pace, after awhile the lack of precision in ball striking gets really frustrating. Despite that, Mario Tennis is still great fun. Nice review, but Daisy also appeared in NES Open Tournament Golf, and apparently in Mario is Missing. This review did make me wonder, though... if it weren't for Camelot, would we have seen Daisy and Birdo reappear in the franchise? Would Wario ever get a partner to scheme with? God bless them. Meh, I'm sort of tired of them not implementing full functionality on their N64 games. It's not like they rushed to release this Wii launch month. It's been over 3 years. They could have added in the bonus characters/courses. I know it wouldn't be possible to to the GBC linkup, but it couldn't have been THAT difficult to unlock the courses already programmed in the N64 game. Forget the other taglines, this one is the best I've yet seen from a review! Great review, Drake. I've only played the Game Boy Color version of the game, and I find it very fun! Tennis video games ftw!!! The issue I have w/ not getting this is the custom-character creation, & unlockables on both versions. I used to own both games, sold them, then years later I bought the 64 game again, & I still am going to get the GBC game. I already have a transfer pak. Further, MT had a leg up on both Golf, & both games' sequels for the Cube. Not only did it have the custom character creation, but when you wanted to create a new character, you didn't have to delete your entire N64 data, you just had to delete the custom character data on the N64, as there was an option to delete exclusively that data. Plus, unlike Golf, the N64 cart actually saved your custom characters. Golf you had to transfer them to the N64 game every time. If N would just open themselves up on the emulation grounds, fully utilize their hardware, & make a handheld VC, this issue would be a non-issue. @LightSamus: In theory, as long as the package of game rom, & emulator are configured in just the right settings, it would work. But I doubt it would, as N might have altered the rom to omit the now unaccessable data, & that in general everything that you're mentioning just might not "click" together. They could still update it later either way. mario golf and tennis for N64 are my favorite games. 10/10 BOTH! @A-SWE thanks for the knowledge about dk jr. Do you think he will ever appear in another game as dk jr not diddy kong. 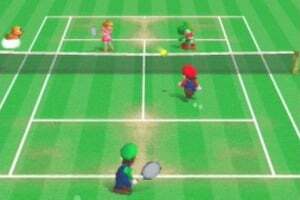 I was stuck on either buy the NPC Mario Power Tennis (Which I have never played) or going with Mario Tennis (N64) (which I have played MANY times as a kid). I think that this review has really pushed me more towards the original. It will not only give me lots of great nostalgia, but like you said in the conclusion, it's a pure tennis experience without unnecessary gameplay elements. I dont think DJ Jr. will ever return. My theory about his appearence in SMK is just for having a white shirt, making him more visible. Mario Tennis is a good game but I came to the conclusion I'm not into this genre. Aside from that, MT did the best to give me a good time. The overly childish presentation (especially the intro) with ugly, blocky characters feels weired. This game is incredibly overrated. The gameplay was laggy and slow, the controls were too tight, the stages looked too ordinary and didn't have the Nintendo charm that I expected (and this problem wasn't fixed in the sequel, either), and the graphics are jagged and ugly for a twilight N64 title: Super Mario 64, which was out four years before this game, was graphically superior. All in all, a pretty messy and mediocre game that gets so much praise for reasons way beyond me. ^ @YoshiSage: The gameplay is probably laggy/slow, due to it not being the actual cart game. Or are you referring to playing the actual cart, on an N64, not the Wii, or emulator? I first played this on the actual cart. And it was mediocre. Still is. I prefer the Gamecube version of power tennis to this by miles.